Do you need to simplify the way to connect your compute modules with the SAN? 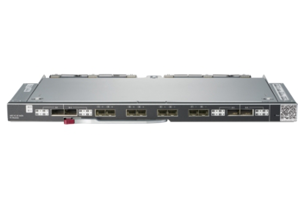 The HPE Virtual Connect SE 16Gb Fibre Channel Module for HPE Synergy is a SAN interconnect that simplifies Synergy Compute Module connections by cleanly separating the frame from the SAN. It simplifies the process of connecting Synergy modules to Fibre Channel networks by reducing cables and your SAN switch management domain, and change Synergy Compute Modules in minutes. You can reduce costs and simplify connections to SANs, consolidate your network connections, and enable administrators to add, replace and recover Synergy Compute Module resources on-the-fly. Standards-based, it looks like a pass-thru device to the Fibre Channel network, yet provides all the key benefits of integrated switching including high performance 16 Gb uplinks to the SAN. The integrated design frees up rack space, reduces power and cooling requirements, while reducing cables and utilizing small form-factor pluggable transmitters. HPE Virtual Connect SE 16Gb Fibre Channel Module for HPE Synergy is compatible with all other NPIV standards-based SAN switch products. It provides high performance and end-to-end connections with your favorite brands of SAN fabric. Functions as a simple Fibre Channel Host Bus Adapter (HBA) to the SAN network while reducing cable complexity. Any change to the compute modules is transparent to its associated network, cleanly separating the Synergy Compute Modules from the SAN and relieving SAN Administrators from maintenance. Managed by industry–leading, software-defined, infrastructure-based HPE OneView. HPE OneView allows the SAN administrator to define available SANs, Synergy Compute Modules connections, and manage Synergy Compute Module connection profiles. It provides simple, seamless connectivity between virtualized Synergy Compute Modules and SAN fabric.